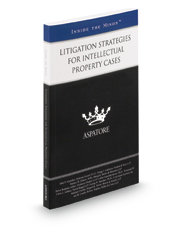 Aspatore legal title Litigation Strategies for Intellectual Property Cases provides an authoritative, insider's perspective on navigating regulatory evolutions and successfully bringing and defending against lawsuits. IP laws are constantly at the forefront of legal evolutions. The ability for people to stream digital content, which has changed the face of TV and music, has also brought along increased copyright infringement and nonpracticing entities (NPEs). Litigation Strategies for Intellectual Property Cases is written by partners from law firms across the nation who guide you through best practices for addressing internet-related IP infringement and determining the strength of a case. These top lawyers give you specific advice on managing your client's expectations, developing a litigation team to build the case, and utilizing early analysis on every step in the litigation process. This book also analyzes the possible future of streaming digital content and outlines challenging trends in legislation. You'll find key strategies for monitoring IP and copyright developments and ways you can keep up to date on inconsistent interpretations of the law that you might not have known about before. With this book, you'll be better prepared to face the upcoming year in IP, and better able to answer any questions your clients have about the future in this area of law.